Can someone be a high and a low? If so it’s Tom Hiddleston. I love Loki and he deservedly won Best Villain but his insistence on taking the microphone from SAMUEL L. JACKSON to throw in a lame joke after Avengers won Best Fight was annoying and his Best Villain speech went on for ever! However, his [sarcastic?] insistence on thanking One Direction’s Liam Payne for naming his new dog Loki and spreading the word about the Thor baddie made me laugh so maybe it all balances out [Unless he wasn’t being sarcastic, then we’re back to a fail]. But he was charming on the red carpet, where he told me he thinks Loki is misunderstood but he knows he’s the only who thinks it so maybe he’s not so bad. This entry was posted in Gossip and tagged Best Villain, Chris Evans, Liam Payne, Loki, MTV Movie Awards, One Direction, Tom Hiddleston. Bookmark the permalink. In all fairness, Sam Jackson wasn’t part of the winning scene. It really didn’t make since for him to be the spokesperson. 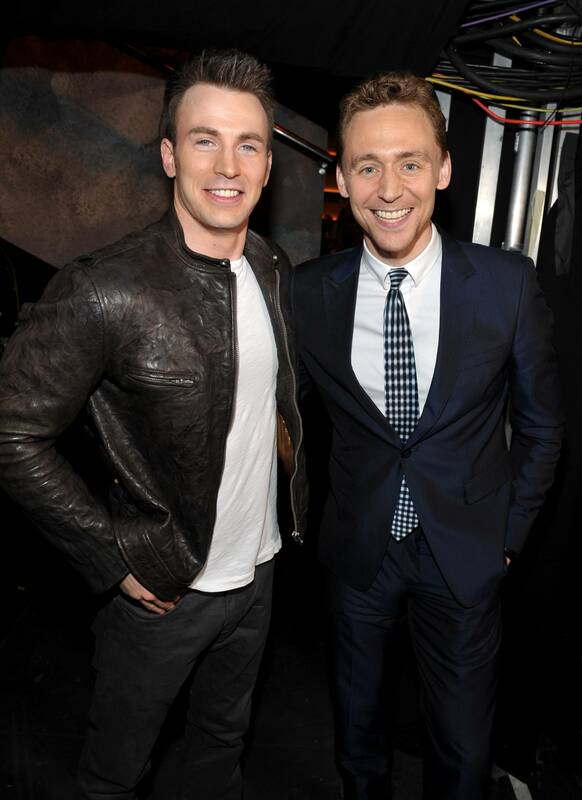 The award was Best Fight – Avengers against Loki. Chris Evans was the only other legitimate person to comment and he didn’t want to. Tom Hiddleston did fly from London to receive the award. Why begrudge him a few moments? Honestly you are in the minority on this. Twitter exploded (is still exploding) from his Best Villian acceptance speech. Tom Hiddleston isn’t everyone’s cup of tea but at least he seems comfortable in his own skin and genuinely kind.